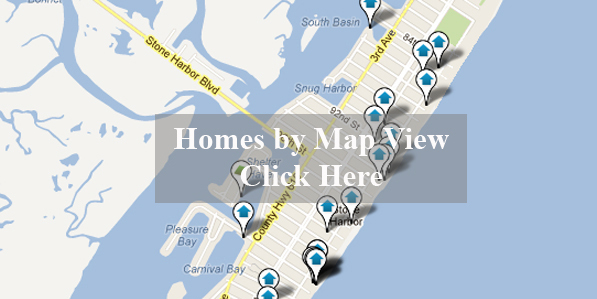 Are you looking for homes for sale in Stone Harbor NJ? Stone Harbor has many real estate options from beachfront to Bayfront. There are some exceptional properties in the 300-500k range. The island known as Seven Mile Beach is but three or four city blocks in width. Stone Harbor is located in the southern half of the island stretching from 80th Street to Hereford Inlet and has a bunch of great restaurants with plenty of activities revolving around the beach to the bay, including a bird sanctuary. Stone Harbor NJ homes for sale is our specialty. Below are just a few of the newest homes to hit the market. Our website provides you the ability to view all active homes for sale in Ocean City, Strathmere, Sea Isle City, Avalon, Stone Harbor, Wildwood, and Cape May. The site is easy to use for all your property search needs. Featuring the best foreclosures, bank owned homes, land, and homes for sale at the Jersey Shore. Contact us! Sign up to the right to receive free daily email alerts as they hit the market. Start planning to buy your beach home today and find out what makes Stone Harbor such a awesome destination for thousands of vacationers. Contact us to view a home today or inquire about a properties rental income history! Click below for some of the latest homes for sale in Stone Harbor NJ, including all new construction in Stone Harbor, Stone Harbor NJ Short Sales and Stone Harbor, NJ Foreclosures. Bookmark this site and sign up now for full access and to stay current on the latest new listings in Stone Harbor. Click below for all homes for sale in Stone Harbor NJ!